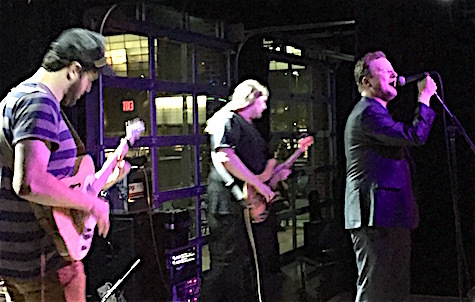 Protomartyr at Slowdown Jr., Aug. 12, 2016. They return to Slowdown Jr. tonight. I intended to do a Ten Questions interview with Joe Casey from Protomartyr, who plays tonight down at Slowdown Jr. I got in touch with the press people at Domino Records (Protomartyr’s label) and sent them the survey. The Domino guy immediately wrote back and said he could, indeed, send the questions but didn’t think I’d get the interview responses I was expecting. He included a yet-to-be-published question-and-answer snippet with a reporter named “Leo.” Casey responded with about 100 words of pure venom. I told Domino never mind. Fact is I don’t have time do a real interview with Casey — scheduling, research, writing the questions, doing the actual interview, transcribing then writing the story takes hours of time I don’t have for an endeavor that doesn’t pay a penny. I don’t know who Leo works for but I’m guessing he’s not getting paid for being lambasted by Casey. He was just trying to help out the band, which is what I’m trying to do when I do Ten Questions interviews. They’re relatively painless, take little time to write, but at least give readers 1) a head’s up that the band’s coming through town, 2) a brief description of their sound/music/style, and 3) some feedback from a musician about some very basic questions: What do you like, what don’t you like, what’s it like to be a musician, how do you manage to make it happen in the era of a decomposing music industry. A few days ago I had a brief discussion about music with a 21-year-old. I asked her what kind of music she buys. Her response: She’s never bought music in her life. She listens to everything on YouTube. “Why would anyone buy music?” That’s where we are, or certainly where we’re going. That said, I’m planning on heading down to The Slowdown tonight for Protomartyr. I’ve seen these guys about a half-dozen times — they put on a good show. It’s worth it just to see Casey do his thing, in a sportcoat, looking like an insurance salesman, spitting out the words to their latest awesome album, Relatives in Descent. Check out some tracks below. Detroit proto-punk instrumental band Hydropark opens at 9 p.m. $15. Also tonight, Brad Hoshaw is hosting a benefit for NAMI (National Alliance on Mental Illness) at fabulous O’Leaver’s. Joining him are Jack Hotel and Clarence Tilton. Bring your cowboy hat. $5, 9:30 p.m.
Also starting tonight and going on tomorrow is We’re Trying Records Presents: House Fest II. The location is Lucy’s Public House, 8932 Blondo St. They’ll have two stages going, with bands from all over the midwest and beyond. Ten bands slated for tonight starting at 6:30 p.m.; 19 bands starting tomorrow at 1:40 p.m. $10 per day. This is a pretty big deal. Get details and set times right here. Dicey Riley Band at The Dubliner, March 17, 2013. They’re back this St. Patty’s Day. Tomorrow, of course, is St. Patrick’s Day — never a good day for live indie music. Everyone has their own traditions; many just stay home and avoid the amateurs. We always go to The Dubliner for St. Patrick’s Day, and have for years. 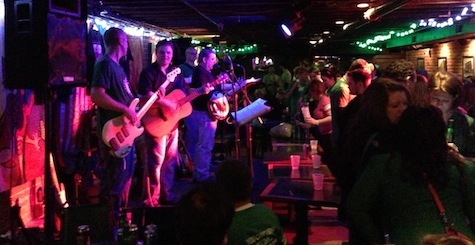 This year, Dicey Riley (ex-Turfmen) is handling the music, which makes the Dubliner the only place to be. Music starts at 2 p.m. and runs til 6, then an hour break, and then they’re back from 7 to 11 p.m. See you there. Sunday night is the Titus Andronicus show at Slowdown Jr. I wrote about a couple days ago. Again, this is an acoustic-duo version of Titus, which is promised to be more laid-back. We’ll see. Opening is Rick McGuire from Pile. Tickets are $13 Adv/$15 DOS. Show start at 8 p.m.
Also Sunday is MilkShopFest at Petshop Gallery in Benson. We’re talking five touring bands (including Kid Chrome) and two locals, including the mighty BIB. $5, 7 p.m. Full line-up and other details here.